Investors balk at the gloomy picture painted by the latest round of economic data. NEW YORK (TheStreet) -- Stocks suffered their worst single-day drop in three weeks Thursday as investors were spooked by a gloomy batch of global economic data, a bearish trading call by Goldman Sachs and disappointment with the outcome of the Federal Reserve's latest policy meeting. Expectations that Moody's plans to announce its long-anticipated downgrades of 15 global banks at the close also exacerbated losses in the final hour of trading, pushing all three major U.S. equity indices lower by about 2%. The action in other asset classes was volatile as well with gold losing $50, bond yields flirting with a dip below 1.6%, and oil breaking below $80 a barrel. The dollar rallied by almost 1% as demand for safe-haven assets rose. 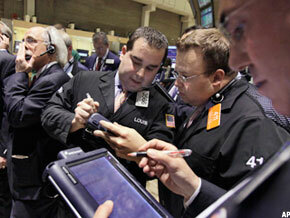 Dow Jones Industrial Average plunged 251 points, or 1.96%, to close at 12,573, just above a low of 12,561 on the day. The S&P 500 lost 30 points, or 2.23%, to finish at 1325. The Nasdaq was hit the hardest, dropping more than 71 points, or 2.44%, to settle at 2859, snapping a five-day winning streak in dramatic fashion. Merck ( MRK was the only Dow component to end the day in the green. Among the biggest percentage decliners were Alcoa ( AA, Bank of America ( BAC, Cisco ( CSCO, Hewlett-Packard ( HPQ, and Intel ( INTC, all down more than 3%. Decliners outpaced gainers by a ratio of about 4-to-1 on both the New York Stock Exchange and the Nasdaq. All ten major sectors on the S&P 500 finished in the red, with the technology, services, energy, capital goods, financials and basic materials sectors experiencing the steepest declines. The selling pressure picked up after news broke that Goldman Sachs was recommending shorting S&P 500. The firm set a target of 1285 for the index recommended a stop on a close above 1390. It cited increasing signs that the economic recovery is slowing as part of its motivation. "This morning, the Philly Fed print of -16.6, down sequentially and worse than expected, provides further evidence that weakness has extended into June," the Goldman note said. "Although yesterday's FOMC delivered easing as expected, with a dovish statement, positive risk sentiment ahead of the FOMC had already buoyed markets," the firm said. "And we now think, with incremental US monetary policy on hold, the market will need to confront a deteriorating growth picture near term." Stocks finished mixed Wednesday as investors expressed mild disappointment with the Federal Reserve's much-anticipated decision to prolong its Operation Twist bond maturity extension program. The central bank also lowered its expectations for U.S. gross domestic product growth in 2012, going to a range of 1.9%-2.4% from 2.4%-2.9%, and adjusted its projections for employment data to reflect slowing growth. Fears about a global slowdown intensified Thursday after HSBC and Markit Economics said that the flash China manufacturing purchasing managers index came in at 48.1 in June, sinking to a seven-month low despite the recent interest rate cut by the Chinese government. Levels below 50 point to contraction. The Hong Kong Hang Seng index settled down 1.3% and the Nikkei in Japan closed up 0.82%. Meanwhile, The Markit flash eurozone PMI composite output index came in at 46 in June, signaling that the private sector economy shrank at a rate unchanged from May. With the exception of a marginal increase in January, the survey has recorded continual contraction since last September, with the rate of decline having gathered significant momentum in the second quarter. The FTSE in London settled down by 0.99% and the DAX in Germany declined by 0.77%. In U.S. economic news, the Labor Department reported that weekly initial jobless claims for the week ended June 16 fell to 387,000 from an upwardly revised figure of 389,000. A level below 350,000 is associated with a consistent improvement in the unemployment rate. Economists surveyed by Briefing.com were expecting jobless claims of 380,000. The previously mentioned Philly Fed's business outlook survey fell to minus 16.6 in June, the weakest read going back to August 2011, from May's minus 5.8 figure. Economists were expecting a read of minus 3.5. In addition, the National Association of Realtors said that U.S. existing home sales fell 1.5% to a seasonally adjusted annual rate of 4.55 million in May from 4.62 million in April. Economists surveyed by Briefing.com expected existing home sales to fall to a 4.5 million annual rate. Lawrence Yun, chief economist at NAR, said inventory shortages in certain areas have been building all year. "The slight pullback in monthly home sales is more likely due to supply constraints rather than softening demand. The normal seasonal upturn in inventory did not occur this spring," he said. "Even with the monthly decline, home sales have moved markedly higher with 11 consecutive months of gains over the same month a year earlier." The Federal Housing Finance Agency's housing price index rose 0.8% on a seasonally adjusted basis in April. The previously reported 1.8% increase in March was revised downward to reflect a 1.6% increase. August crude oil futures dropped $3.25 to settle at $78.20 a barrel. August gold futures shed $50.3 to settle at $1,565.50 an ounce. The benchmark 10-year Treasury jumped 13/32, diluting the yield to 1.620%, while the greenback rose 1.06% according to the dollar index. In corporate news, Rite Aid ( RAD reported first-quarter earnings that met analysts' expectations but it lowered its sales guidance for the year. The drugstore chain reported a first-quarter loss of $30.7 million, or 3 cents a share, narrower than a year-earlier loss of $65.5 million, or 7 cents a share. Shares gained nearly 7%. Red Hat ( RHT beat Wall Street's first-quarter profit expectations but it posted weak billings and provided second-quarter guidance slightly below estimates. The stock sank roughly 6%. Shares of Bed Bath & Beyond ( BBBY tanked after the specialty retailer gave a disappointing outlook on Wednesday for its fiscal second quarter. The Union, N.J.-based company said it expects earnings of 97 cents to $1.03 a share in the three months ending in August, below analysts' expectations of a profit of $1.08 a share. Shares plunged 17%. Burger King Worldwide ( BKW shares rose 2.6% as the company returned to the New York Stock Exchange. The fast food giant priced its IPO at $14.50 and closed the session at $15.40. Shares of Celgene ( CELG dived 11.5% after the drug company withdrew its application for the approval of blood cancer drug Revlimid for maintenance usage. Meanwhile Onyx Pharmaceuticals ( ONXX shares soared 43% after its blood cancer treatment carfilzomib garnered very positive assessments from a Food and Drug Administration panel. -- Written by Andrea Tse and Shanthi Bharatwaj in New York.